Hi from the Critique Club. HOpefully I can offer a few thoughts on your photo which you will find valuable. Composition: This picture needs a portrait orientation to show more of the bather's hands and to crop out the man on the right. Or a shift in camera viewpoint could have accomplished this. Technical: Focus is soft on subject and water. Most people would be OK with the blurred water but they would find a sharper subject more appealing. Probably shoot for minimum 1/250 shutter speed. Exposure looks good and BW is a good choice. Challenge: The title is long and "summer bath" would have been sufficient with out the explanation. For most voters, this entry was probably a stretch for them to connect to comfort. 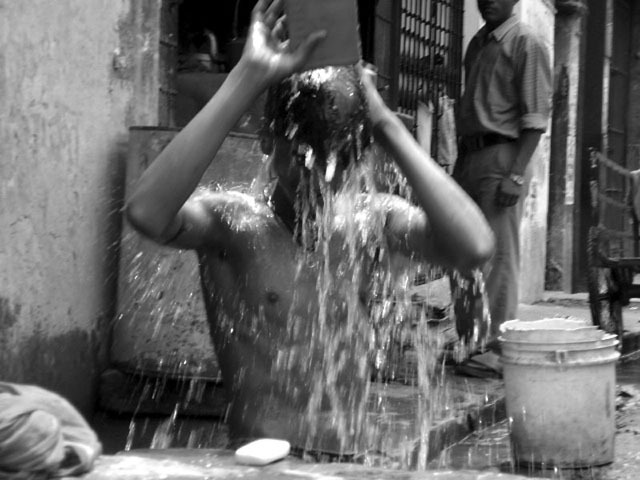 LIving in a place with hot summers I can tell you that I would find comfort in a cold shower!! Work on some of the things I listed above and watch your vote grow. After looking at your profile page, I see you like black and white They are very nice pictures and I would love to see you enter a picture with some bold color? I have not been to INdia, but I picture it as a country full of color. Please PM me with any questions or comments. gr8 pic love the water spray! Like the b&w, but out of focus a bit. Would have been great with faster shutter speed. Overall photo is blurry, not just the moving water and arms. Proudly hosted by Sargasso Networks. Current Server Time: 04/22/2019 05:58:00 PM EDT.